artists, art societies, art galleries and other organisations who need to make sure they comply. To start with, this is going to be pretty much a list of resources - but I'll aim to extract and organise information as issues that need to be addressed become clearer. The quotations below (in blue) highlight and focus on key facts and statements made to date. DISCLAIMER: I am NOT an expert on this topic - even if I know more than you! Nothing stated on this page is legal advice. Like you I'm just trying to work my way through the maze of online information about GDPR. Hence this resource should NOT be construed or relied upon as legal advice. You are not my client and I do not know your individual circumstances - meaning I have no liability to you in any circumstances should you choose to rely on any of the materials on this page - although whatever is published by the ICO should be more authoritative than most. More formally - This is a education portal and the information contained within this portal does in no way constitute legal advice. Any person who intends to rely upon or use the information contained herein in any way is solely responsible for independently verifying the information and obtaining independent expert advice if required. adopted by the European Union on 27 April 2016.
became enforceable as from 25 May 2018.
a single set of rules applies to all EU member states. It extends the scope of EU data protection law to ALL FOREIGN ENTITIES offering goods or services to EU residents or processing data of EU residents - irrespective of where they are based and irrespective of where the data processing takes place. data may not be processed unless there is at least one lawful basis to do so - and it can ONLY be processed for the lawful purpose for which it was collected. The General Data Protection Regulation (GDPR)Regulation (EU) 2016/679 on the protection of natural persons with regard to the processing of personal data and on the free movement of such data. The Data Protection Law Enforcement Directive Directive (EU) 2016/680 on the protection of natural persons regarding processing of personal data connected with criminal offences or the execution of criminal penalties, and on the free movement of such data. EU-US Privacy Shield The European Commission is committed to reviewing the arrangement on an annual basis to assess its continued level of adequacy for the protection of personal data. National Data Protection Authorities - a listing of all the National Data Protection Authorities for each EU Country. These, in turn will have information like that produced by ICO for the UK - see below. The manuscript for this handbook was completed in April 2018. Updates will become available in future on the FRA website at fra.europa.eu, the Council of Europe website at coe.int/dataprotection, on the European Court of Human Rights website under the Case Law menu at echr.coe.int, and on the European Data Protection Supervisor website at edps.europa.eu. The Information Commissioner's website has extensive information about GDPR which is being expanded on a regular basis. Very much worth keeping an eye on. The law on data protection says what you should do when you collect, use, store or do anything else with people’s personal data. This law changes on 25 May 2018. - loss of availability of personal data. People have a right to have their personal data kept safe, only used in ways that are properly explained to them, and for certain uses of their data, to which they expressly consent. ​This is a requirement of the Data Protection Act. Hackers should not be getting to core systems in the first place. Privacy by design should be in every part of your information processing, from the hardware and software to the procedures, guidelines, standards, and polices that your organisation has or should have. Meltdown and Spectre – what should organisations be doing to protect people’s personal data? Definitions: Read the key definitions section of our Guide to the GDPR. ​Consent: The consent checklist sets out the steps you should take to seek valid consent under the GDPR. ICO fee and registration changes next year - read the comments too! What does it mean for your business as an artist? what are the specific issues facing artists et al as sole traders? what information is it permissible to share? can artists and organisations continue to use existing marketing lists? Note: There is absolutely no information on the Arts Council website. You can try looking - but for me it gave every appearance of being completely unaware that GDPR is happening and that it has implications for the art sector! - Performance of a contract to which the subject is party. - Compliance with a legal obligation. - To protect the vital interests of the data subject or of another natural person. - For the performance of a task carried out in the public interest or in the exercise of official authority. - For the purposes of the legitimate interests pursued by the controller or by a third party, except where such interests are overridden by the interest or fundamental rights and freedoms of the data subject which require protection of personal data, in particular where the data subject is a child. Use of personal data for marketing or not for profit purposes provides an exemption from having to pay the Data Protection Fee. However volunteers are no different to employees in the eyes of GDPR. Data Protection and Art & Cultural Heritage | Collyer Bristow LLP - This article sets out some of the main points for those working in the sector to consider in order to comply with the new regime. GDPR Advice for Areas and Societies (PDF) | The Arts Society (via South West Area) - Unlike most legislation GDPR is “principles based” meaning that interpreting the rules to fit the special circumstances of your own organisation is vital. GDPR and fundraising: Everything you need to know | Arts Professional - Under GDPR, all fundraising is deemed ‘direct marketing’ and charities will require an ‘opt in’ consent for most forms of communication where named individuals are involved. Success Guide - Successfully managing privacy and data regulations in small museums | The Association of Independent Museums - This guide is for trustees, senior staff and members of staff and volunteers involved in fundraising or marketing. However, it would be useful to share the key points with all staff and volunteers since so many of them will come into contact with data collection and processing in the course of their working week. ....charities can send direct marketing by post or make calls to numbers not registered with the telephone preference service, provided they can satisfy the legitimate interest condition. never ever share or publicise personal data (e.g. by sharing emails using the cc box) except with those who have a legal and legitimate "need to know"
Do people know you have their personal data and understand how you use it? Do you tell people how you use their personal data? Do you tell people if you’re sharing their data? Do you tell people what you plan to do with their data either in paper form, such as using leaflets or posters, or online through a privacy notice or statement? The name of your business and the person responsible for data protection. Why you hold the personal data (your lawful basis) and what you do with it. Where you got the data from. 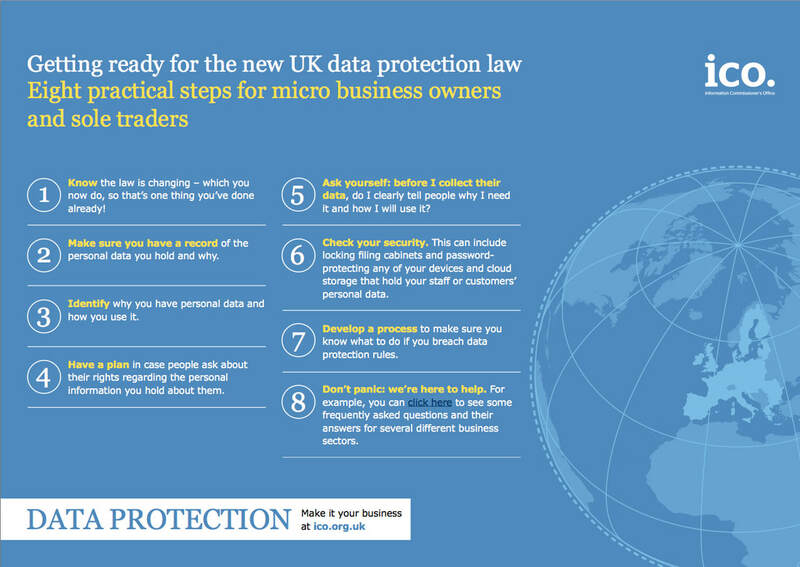 Who you share the data with and how you do this, including any sharing outside the UK. How long you keep the data for. How people can request access to, or correction or deletion of, their data. How to complain to the ICO. Whether you make automated decisions or do profiling based on the data you hold. It is a criminal offence for anyone to knowingly or recklessly obtain (or disclose) information about someone from a data controller without its consent. Some examples of what art organisations (art societies and art galleries do) - without thinking first! An email sent to me about an event by an organisation acting on behalf of an art society disclosed its complete mailing list and all the e-mail addresses on it to everybody on that mailing list. Another art society recently sent me its handbook. It contained every member's name, address, telephone number and e-mail address. Apart from the fact that I don't need all of this information, it represents a fraudster's dream come true. An art society had a laptop stolen recently. It contained all the personal contact details of all its members. The data was not encrypted. A fourth (and fifth and sixth and seventh....) art society lists the home addresses and telephone numbers of all its members in the brochure for its annual exhibition - distributed without making a note of who gets it. ​Protecting our members and users data: GDPR and what we are doing | Axis Web - which is making changes to policies, processes, services and systems to ensure that AxisWeb complies with GDPR and continues to put data protection first. Art societies and art galleries - data protection, privacy and you | Making A Mark - a blog post published in 2008 (so predates GDPR) but relevant as to basic concepts re. behaviour - see extract below. 1. Does your art society and/or art gallery understand that it has to protect personal data relating to individuals? 2. Are the administrators 'data protection aware'? 3. Do they process personal information about individuals in a secure way? 4. Are the officers of your art society / managers of your art gallery aware of their legal responsibilities under data protection legislation? All agencies which you transact with and which processes personal data of EU residents MUST be compliant with GDPR - or else you should NOT use them. Artists and art organisations rely on third parties to help them with specific functions eg receiving/making payments; sending emails and newsletters, marketing and promoting their art. All of these third parties must also comply with ALL the GDPR requirements relevant to them. If their business is data processing then they may have additional requirements. - get the person’s consent to store a cookie on their device. Cookies which identify individuals are considered to be personal data. Learn more about Google's commitment to GDPR here. We are working hard to prepare for the EU’s General Data Protection Regulation (GDPR). Keeping users’ information safe and secure is among our highest priorities at Google. Over the years, we have spent a lot of time working closely with Data Protection Authorities in Europe, and we have already implemented strong privacy protections that reflect their guidance. We are committed to complying with the new legislation and will collaborate with partners throughout this process. Google is committed to complying with the EU General Data Protection Regulation (GDPR) for G Suite and Google Cloud Platform services. Google Cloud & the General Data Protection Regulation - some aspects you may want to consider when conducting your assessment of G Suite and Google Cloud Platform services. This is the statement which appeared on Google's Blogger blogs on 25th May 2018. ONLINE PAYMENTS - Square Inc.
GDPR FAQs | Square - Includes "How Do I Know if the Processing of Personal Data Is GDPR Compliant?" Please note that posts and guide are for informational purposes only, and should not be considered legal advice. AWeber does NOT currently recognise the General Data Protection Regulation. When using the term (and GDPR) in its search facility there were no results. My conclusion is AWeber is not GDPR compliant. GDPR and Squarespace | Squarespace Help - constantly updates a blog post about developments on GDPR implemented by Squrespace - PLUS advice for those using Squarespace websites as to what they should be doing. The guide is available as a resource, but should not be construed or relied upon as legal advice. GDPR - FAQ | Weebly Support Centre - This ONLY addresses the facts of GDPR for the website owner. It makes no statement as to whether or not Weebly is compliant with GDPR. Given that this website is built on Weebly I'm more than a little concerned about this and am sending them regular emails asking for more PUBLIC information re. THEIR compliance. The following are Facebook Groups that have been set up to review and address issues associated with GDPR. Bear in mind that the bulk of discussions will of no relevance to art organisations or artists - but many of the issues that other organisations and sole traders face are broadly similar. EU GDPR (General Data Protection Regulation) & E-Privacy Regulation​ (Closed Group) - you MUST respond to the three joining questions to gain membership; it's clear they are very anti-spam! GDPR For Online Entrepreneurs (UK, US, CN, AU) (Closed Group) - RECOMMENDED set up by Suzanne Dibble, the Small Business Law Expert. It collected 7,000 members in just 4 weeks! When reviewing advice from lawyers look at what their expertise is to be providing advice about GDPR. Be mindful of WHEN the advice was produced and whether it has been superseded by any official information which either clarifies or updates official guidance on topics or interpretation. There is a lot of hype around GDPR and the headline busting €20m fines for business owners that don't comply. Multi-award winning business lawyer and data protection expert Suzanne Dibble busts the myths on GDPR, sets out clearly what you really need to know and shows you the simple steps you need to take for compliance. Blog posts can be very useful sources of alternative perspectives and information tailored to specific circumstances rather than reiterations of the official guidance. GDPR What You Need To Know For Your Small Business | Yvonne Radley's Big Me Up Media - looks to me like she's feeling her way along with the rest of us!